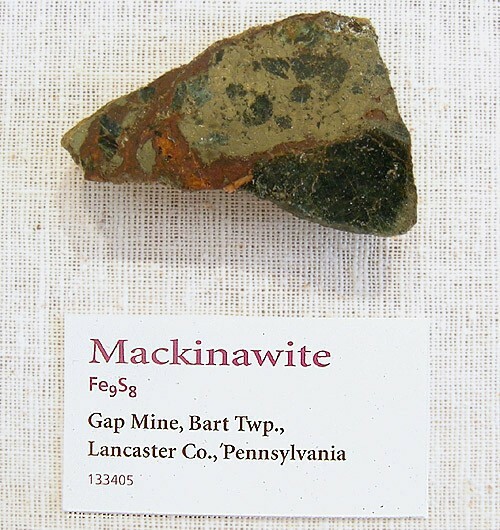 Mackinawite: Mineral information, data and localities. Also given as (Fe,Ni)1+xS (x = 0 to 0.11). Named after the discovery locality. May be confused with valleriite. Mackinawite may form as a metastable product of sulfidation of goethite in the CH4 atmosphere but only when CO2 is added, as shown by an experiment of Wang et al. (2015); it is followed by pyrrhotite. As well-formed thin tabular crystals, to 1 mm; massive, fine-feathery. American Mineralogist (1963): 48: 215. Kouvo, Olavi, Vuorelainen, Yrjo, and Long, J.V.P. (1963): A tetragonal iron sulfide. American Mineralogist 48, 511-524. Evans H T, Milton C, Chao E C T, Adler I, Mead C, Ingram B, Berner R A (1964): Valleriite and the new iron sulfide, mackinawite. U.S. Geological Survey Professional Paper, 475-D, 64-69. Takeno, S. and Clark, A.H. (1967): Observations on tetragonal (Fe,Ni,Co)1+xS, mackinawite. Journal of Science Hiroshima University, Series C, 5, 287–293. Clark, A.H. and Clark, A.M. (1968): Electron microprobe analysis of mackinawite from the Ylöjärvi deposit, Finland. Neues Jahrbuch für Mineralogie Monatshefte, 6, 259–268. Vaughan, D.J. (1969): Nickelian mackinawite from Vlakfontein, Transvaal. American Mineralogist, 54, 1190–1193. Clark, A.H. (1970): Nickelian mackinawite from Vlakfontein, Transvaal: a discussion. American Mineralogist, 55, 1802–1807. Chemie der Erde (1981): 40: 237. Takeno, S., Moh, G.H., and Wang, N. (1982) Dry mackinawite synthesis. Neues Jahrbuch für Mineralogie-Abhandlungen, 144, 291–34. Schoonen, M.A.A., Barnes, H.L. (1991) Reaction forming pyrite and marcasite from solution II. Via FeS precursors below 100° C. Geochimica et Cosmochimica Acta: 55: 1505-1514. Krupp, R. E. (1994): Phase relations and phase transformations between the low-temperature iron sulfides mackinawite, greigite, and smythite. European Journal of Mineralogy, 6, 265-278. American Mineralogist (1995): 80: 188. Lennie A R, Redfern S A T, Schofield P F, Vaughan D J (1995): Synthesis and Rietveld crystal structure refinement of mackinawite, tetragonal FeS. Mineralogical Magazine, 59, 677-683. Wolthers, M., Van Der Gaast, S.J., and Rickard, D. (2003) The structure of disordered mackinawite. American Mineralogist 88, 2007-2015. Wolthers, M., Charlet, L., Van Der Linde, P.R., Rickard, D., and Vamn Der Weijden, C.H. (2005) Surface chemistry of disordered mackinawite (FeS). Geochemica et Cosmochimica Acta: 69: 3469-3481. Kwon, K.D., Refson, K., Sposito, G. (2015): Transition metal incorporation into mackinawite (tetragonal FeS). Am. Mineral. 100, 1509–1517. Wang, M., Chou, I-M., Lu, W., De Vivo, B. (2015): Effects of CH4 and CO2 on the sulfidization of goethite and magnetite: an in situ Raman spectroscopic study in high-pressure capillary optical cells at room temperature. European Journal of Mineralogy: 27(2): 193-201. Mücke, A. (2017): Review on mackinawite and valleriite: formulae, localities, associations and intergrowths of the minerals, mode of formation and optical features in reflected light. Journal of Earth Science & Climatic Change 8 (11), 419 (18 pp.). Ch. Marignac, Bull. Minéral. , 1988, 111, pp. 359-381. Mineralogical Magazine 1997 61 : 861-877; FERRACUTTI, G.; BJERG, E. and MOGESSIE, A.. 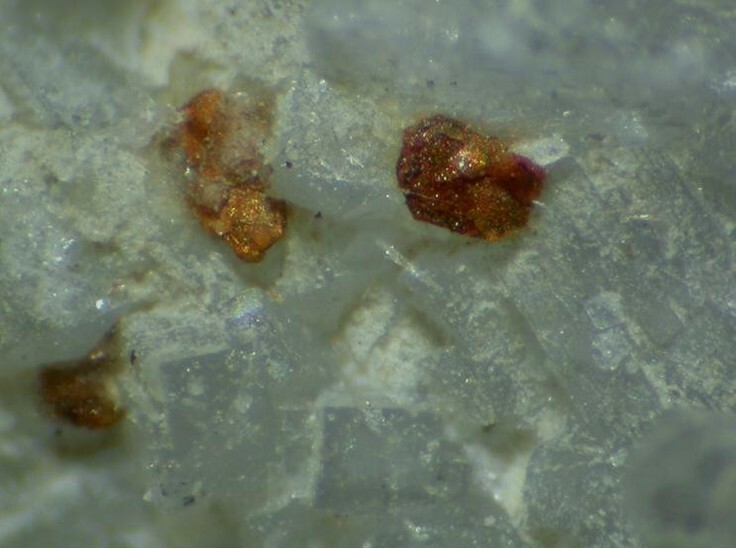 Precious and base metals in Las Águilas, Sierra de San Luis: Mineralogy, genesis and evolution. Rev. Asoc. Geol. Argent. [online]. 2007, vol.62, n.3, pp. 434-446. Gilligan, L.B., Suppel, D.W. (1993) Metallogenic Study and Mineral Deposit Data Sheets: Nymagee 1:250 000 Metallogenic Map (SI/55-2). Geological Survey of New South Wales, Sydney, 171 p. McKinnon, A.R., Sharpe, J.L., Williams, P.A. (2005) Other notable mineral occurrences in the Cobar region. Australian Journal of Mineralogy, 11, 117-121.
ⓘ Freehold Mine East ? McQueen, K.G. (1981) The nature and metamorphic history of the Wannaway nickel deposit, Western Australia. Economic Geology 1981, Vol. 76(6), pp.1444-1468. Horner, J., Neubauer, F., Paar, W.H., Hansmann, W., Koeppel, V., and Robl, K. (1997): Mineralium Deposita 32, 555-568. Vavtar, F. (1979): Syngenetische, metamorphe Erzgefüge der Kies- und Kupferlagerstätte Tschingl bei Feichten im Kaunertal (Ötztalkristallin). Veröffentl. d. Museum Ferdinandeum, 59, 151-163. Sako, Aboubakar. (2014). Prediction of acid mine drainage occurrence at the Inata gold mine-Burkina Faso, West Africa. Academia Journal of Environmental Sciences. 2. 043-051. Econ Geol (1986) 81:1137-1146; Hulbert, L. J., Duke, J. M., Eckstrand, O. R., Lydon, J. W., Scoates, R. F. J., Cabri, L. J., & Irvine, T. N. (1998) Geological Environments of Platinum Group elements. Geological Survey of Canada, Open File 1440. Natural Resources Canada. Huminicki, M. A. E., Sylvester, P. J., Lastra, R., Cabri, L. J., Evans-Lamswood, D., & Wilton, D. H. C. (2008). First report of platinum-group minerals from a hornblende gabbro dyke in the vicinity of the Southeast Extension Zone of the Voisey’s Bay Ni-Cu-Co deposit, Labrador. Mineralogy and Petrology, 92(1-2), 129-164. SABINA, A.P. (1976): Rocks & minerals for the collector: The Magdalen Islands, Quebec and the island of Newfoundland. Geological Survey of Canada Paper 75-36, 199p. Reissued in 2003 as Île de la Madeleine, Quebec, the Island of Newfoundland and Labrador. Geological Survey of Canada Miscellaneous Report 58, 102-103. CAMPBELL, J. L., LAFLAMME, J. G., LEIGH, R. G., MAXWELL, J. A., & SCOTT, J. D. (1985). PROTON. MICROPROBE ANALYSIS OF TRACE ELEMENTS IN SULFIDES FROM SOME MASSIVE-SULFIDE DEPOSITS LOUIS J. CABRI. Nelles, E. W. (2014). Genesis of Cu-PGE-rich footwall-type mineralization in the Morrison deposit, Sudbury (Masters thesis, Laurentian University of Sudbury). Watkinson, D.H. and Ohnenstetter, D. (1992) Hydrothermal origin of platinum-group mineralization in the Two Duck Lake intrusion, Coldwell Complex, northwestern Ontario. Canadian Mineralogist, 30, 121-136. Galley, A.G., Jonasson, I.R., and Watkinson, D.H. (2000): Mineralium Deposita 35, 619-637. Rubin, A. E., Wang, D., Kallemeyn, G. W. & Wasson, J. T. (1988). The Ningqiang meteorite: Classification and petrology of an anomalous CV chondrite. Meteoritics 23, #1, 13–23. (March 1988). Yongrui Zhao and Yunqing Zhen (2006): Journal of Guilin University of Technolog 26(3), 310-319. Zhou, M.-F., Robinson, P.T., Malpas, J., Sun, M., Aitchison, J., Bai, W.J., Hu, X.-F., and Yang, J.-S. (2001): Journal of Asian Earth Sciences 19(4), 517-534. Chuanjie Pu, Dexian Qin, Hong Nian, Xueshu Zhang, Pirajno, F., and Zhuguo Fan (2007): Chinese Journal of Geochemistry 26(4), 374-383. Pašava, J., Vavřín, I., Frýda, J., Janoušek, V., & Jelínek, E. (2003). Geochemistry and mineralogy of Platinum-group elements in the Ransko gabbro–peridotite massif, Bohemian Massif (Czech Republic). Mineralium Deposita, 38(3), 298-311. Geological Survey of Finland 2008. Keivitsa - NICKEL Database; Lamberg, P., Välimaa, J., Parkkinen, J., & Kojonen, K. (2005). Structural, geochemical and magmatic modelling of the early Proterozoic Keivitsa Ni-Cu-PGE deposit in Sodankylä, northern Finland. Extended Abstract. In 10th International Platinum Symposium, Abstract volume. mutanen Tapani 1997. Geology and ore petrology of Akanvaara nd Koitelainen mafic layered intrusions and the Keivitsa -satovaara layered complex, Northern Finland. Geological Survey of Finland, bulletin 395. 233s. ; Le Vaillant, M., Barnes, S. J., Fiorentini, M. L., Santaguida, F., & Törmänen, T. (2016). Effects of hydrous alteration on the distribution of base metals and platinum group elements within the Kevitsa magmatic nickel sulphide deposit. Ore Geology Reviews, 72, 128-148. Stein, H.J., Sundblad, K., Markey, R.J., Morgan, J.W., Motuza, G. (1998): Mineralium Deposita 33, 329-345. Geological Survey of Finland 2008. Rämepuro-Gold Database. Econ Geol (1986) 81:1236-1241; Geological Survey of Finland 2006 Hitura - NICKEL Database; Mäki, T. (1997). Volcanic hosted massive sulphide and gold deposits in the Skellefte district, Sweden and western Finland. Geological Survey of Finland. Papunen, H. and Koskinen, J. 1985. Geology of Kotalahti nickel-copper ore. in: Nickel-copper deposits of the Baltic Shield and Scandinavian Caledonides. Geological Survey of Finland, Bulletin 333, 228-240. Peltonen, P., Pakkanen, L., and Johanson, B. (1995): Re-Mo-Cu-Os sulphide from the Ekojoki Ni-Cu deposit, SW Finland. Mineralogy and Petrology, Vol. 52, pp. 257-264. DE ASCENCAO GUEDES R.. (2000). La Lauzière : les espèces minérales, Savoie, France. Le Règne Minéral hors-série n°6, pp. 24-39. Editions du Piat. Chauris, L. (2014) Minéraux de Bretagne, Les Editions du Piat, 60. Chauris, L. (2014): Minéraux de Bretagne, Les Editions du Piat, 60. Pierrot, R., Picot, P., Feraud, J., Vernet, J. (1974): Inventaire minéralogique de la France n°4. Alpes Maritimes. Editions B.R.G.M, Paris, 168 pp. Ramdohr, P. (1973) The Opaque Minerals in Stony Meteorites. Elsevier Publishing Company: Amsterdam, London: New York. 245 pages. Leleu, M., Morikis, A. & Picot, P. (1973): Sur des minéralisations de type skarn au Laurium (Grèce). Mineral. Deposita 8, 259-263. Econ Geol (1980) 75:572-591; Mukherjee, A. D., Sen, R., & Mondal, A. (1998). Freibergite from polymetallic sulphide deposits of the Delhi-Aravalli belt, Rajasthan. Journal of the Geological Society of India, 52(5), 543-547. Econ Geol (1994) 89:227-245; Marcoux, E., Milesi, J. P., Sohearto, S., & Rinawan, R. (1993). Noteworthy mineralogy of the Au-Ag-Sn-W (Bi) epithermal ore deposit of Cirotan, West Java, Indonesia. The Canadian Mineralogist, 31(3), 727-744.; Yuningsih, E. T., Matsueda, H., & Rosana, M. F. (2014). Epithermal Gold-Silver Deposits in Western Java, Indonesia: Gold-Silver Selenide-Telluride Mineralization. Indonesian Journal on Geoscience, 1(2), 71-81. Camarda, S., Muzio, C., Passarino, G. & Sanguineti, G. (2013). Reppia, Ne, Val Graveglia, Genova. Minerali secondari di un giacimento ferroso cuprifero. Rivista Mineralogica Italiana, 3/2013, 176-185. Piccoli, G.C., Maletto, G., Bosio, P., Lombardo, B. (2007): Minerali del Piemonte e della Valle d'Aosta. Associazione Amici del Museo F. Eusebio - Alba, Ed., Alba (Cuneo), 607 pp. Zucchetti, S. (1968) Mineralizzazioni nichelifere a ferro-nichel nativo e solfuri nel giacimento asbestifero di Sampeyre (Cuneo) ed in altre serpentiniti alpine. Bollettino dell'Associazione Mineraria Subalpina, 5, 106-120; Zucchetti, S. (1970) Ferro-nichel nativo ed altri minerali nicheliferi in serpentiniti anche asbestifere delle Alpi Occidentali. Rendiconti della Società Italiana di Mineralogia e Petrologia, 26, 377-397; Piccoli, G.C., Maletto, G., Bosio, P., Lombardo, B. (2007) Minerali del Piemonte e della Valle d'Aosta. Associazione Amici del Museo "F. Eusebio" di Alba, Ed., Alba, 607 pp. Piccoli, G.C., Maletto. G., Bosio, P., Lombardo, B. (2007): Minerali del Piemonte e della Valle d'Aosta. Associazione Amici del Museo " F. Eusebio" Alba, Ed., Alba (Cuneo) 607 pp. Revello G., Chiorboli S. (1970) - Sulla presenza di associazioni di cubanite, calcopirite, pirrotina, blenda e mackinawite incluse in quarzo a Funtana Raminosa (Sardegna). Periodico di mineralogia – Roma, pp. 211-217. and AA. VV., 1996. Collezionare minerali. Hobby & Work. Bertolin A., Frizzo P., Rampazzo G. (1995): Sulphide speciation in surface sediments of the Lagoon of Venice: A geochemical and mineralogical study. Marine Geology, 123, 1-2, 73-86. Zohka, H. et al (1972) Compositional variations in natural mackinawites and the results of heating experiments. Journal of Science of the Hiroshima University, series C, Geology and Mineralogy, 7, #1, 37-53. Zohka, H. et al (1972) Compositional variations in natural mackinawites and the results of heating experiments. Journal of Science of the Hiroshima University, series C, Geology and Mineralogy, 7, #1, 37-53.; MARIKO, T., KAWADA, M., MIURA, M., & ONO, S. (1996). Ore Formation Processes of The Mozumi Skarn-type Pb-Zn-Ag Deposit in the Kamioka Mine, Gifu Prefecture, Central Japan. Shigen-Chishitsu, 46(260), 337-354. Zohka, H. et al (1972) Compositional variations in natural mackinawites and the results of heating experiments. Journal of Science of the Hiroshima University, series C, Geology and Mineralogy, 7, #1, 37-53.; Bamba, Takeo (1985) Implication of the Composite Mineralization on the Massive Sulfide Deposits of the Shimokawa Mine. Journal of the Faculty of Science, Hokkaido University. Series 4, Geology and mineralogy;Vol.XXI, No.3 pp 363-404; Schoeman, P. (1996). Overview and comparison of Besshi-type deposits: ancient and recent (Doctoral dissertation, Rhodes University). 春名誠, 上野宏共, & 大本洋. (1990). Development of skarn-type ores at the Tengumori copper deposit of the Kamaishi mine, Iwate Prefecture, Northeastern Japan. 鉱山地質, 40(222), 223-244.; Etsuo Uchida (1986) Relation between Zonal Arrangements of Skarns and Temperatures of Formation at the Kamaishi Mine, Northeastern Japan. Mining Geology, 36(3),195-208. Graham, A.L., Michel-Levy, M.C., Danon, J. & Easton, A.J. (1988) The Tuxtuac, Mexico, meteorite, an LL5 chondrite fall: Meteoritics 23(4) :321-323. (Dec. 1988). Wang, Y., & Hsu, W. (2016). Shock-Induced Metamorphism in the Lunar Meteorite Northwest Africa 4734. LPI Contributions, 1921. Pedersen, F.(1976): En geologisk undersøkelse af den kontakt metasomatiske zinkmineralsering i Glomsrud- miner, Buskerud fylke, Norge. Unpublished thesis, Geolgisk Institut,University of Århus, Denmark. 73 s.
Neumann, H. (1985): Norges Mineraler. Norges Geologiske Undersøkelse Skrifter 68. (p. 31). Tufar, W. (1967): Die Kupfervererzung vom Gaskasjavri in Troms (Norwegen). Tschermaks Mineralogische und Petrographische Mitteilungen 12, 61-99. Norges geologiske undersøkelse. Malmdatabasen. Moskodal gruve. Forekomst nr.44 i Nordreisa (1942) kommune. Ixer, R. A., Alabaster, T., & Pearce, J. A. (1984). Ore petrography and geochemistry of massive sulphide deposits within the Semail ophiolite, Oman. Transactions of the Institution of Mining and Metallurgy. Section B: Applied Earth Science, 93, 114-124. Morgan, J.W., Stein, H.J., Hannah, J.L., Markey, R.J., and Wiszniewska, J. (2000): Mineralium Deposita 35, 391-401. Kucha H. 1982: Haycockite and mooihoekite from titanomagnetite ore, Krzemianka, Poland. Mineralogia Polonica, vol. 13, no 2, 27-32.; Morgan, J.W., Stein, H.J., Hannah, J.L., Markey, R.J., and Wiszniewska, J. (2000): Mineralium Deposita 35, 391-401. Mekhonoshin, A. S., Tolstykh, N. D., Podlipsky, M. Y., Kolotilina, T. B., Vishnevsky, A. V., & Benedyuk, Y. P. (2013). PGE mineralization of dunite-wehrlite massifs at the Gutara-Uda interfluve, Eastern Sayan. Geology of Ore Deposits, 55(3), 162-175. Zelenski, M., Kamenetsky, V. S., Mavrogenes, J. A., Gurenko, A. A., & Danyushevsky, L. V. (2018). Silicate-sulfide liquid immiscibility in modern arc basalt (Tolbachik volcano, Kamchatka): Part I. Occurrence and compositions of sulfide melts. Chemical Geology, 478, 102-111. Anthony, Bideaux, Bladh, Nichols: "Handbook of Mineralogy", Vol. 1, 1990; Am Min 66:638-639; Geology of Ore Deposits (2009) 50:755-762; Czamanske. et al (1992). A Proton Microprobe Study of Magmatic Sulfide Ores from the Norilsk-Talnakh District, Siberia (Vol 30, Pg 249, 1992). Canadian Mineralogist, 30, 1189-1189. Grokhovskaya, T. L., Bakaev, G. F., Sholokhnev, V. V., Lapina, M. I., Muravitskaya, G. N., & Voitekhovich, V. S. (2003). The PGE ore mineralization in the Monchegorsk magmatic layered complex (Kola Peninsula, Russia). GEOLOGY OF ORE DEPOSITS C/C OF GEOLOGIIA RUDNYKH MESTOROZHDENII, 45(4), 287-308. Rudashevskiy N.S., Krecer D.A., Orsoev D.A., Kislov E.V. 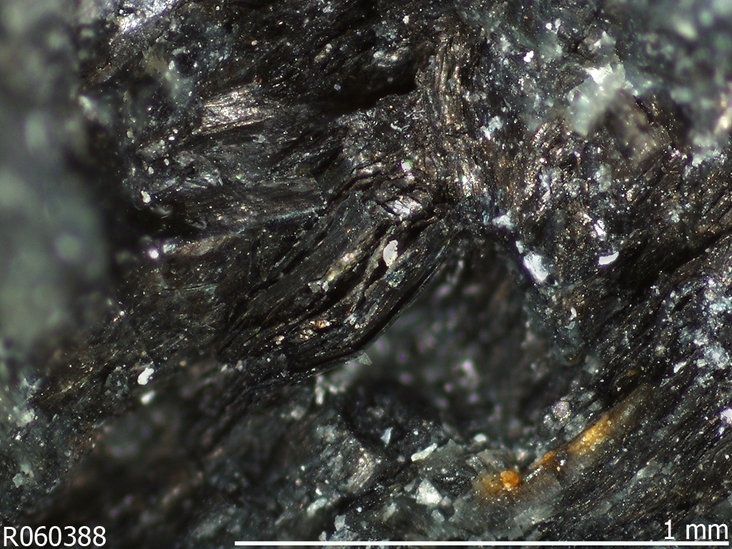 (2003) Palladium-platinum mineralization in vein Cu-Ni-ores of Yoko-Dovyrenskiy laiered massif, - DAN, 391(4), p. 519-522 (in Rus. ); Ariskin, A. A., Kislov, E. V., Danyushevsky, L. V., Nikolaev, G. S., Fiorentini, M. L., Gilbert, S., ... & Malyshev, A. (2016). Cu–Ni–PGE fertility of the Yoko-Dovyren layered massif (northern Transbaikalia, Russia): thermodynamic modeling of sulfide compositions in low mineralized dunite based on quantitative sulfide mineralogy. Mineralium Deposita, 51(8), 993-1011. CHOI, S. G., & IMAI, N. (1985). Ni-Fe-Co Arsenides and Sulpharsenides from the Ulsan Mine, Republic of Korea. Mining Geology, 35(189), 1-16. Zakrzewski, M.A., M.A. & Makovicky, E. (1986): Izoklakeite from Vena, Sweden, and kobellite homologous series. Canadian Mineralogist 24, 7-18. Nysten, P. (1990): Tsumoite from the Björkdal gold deposit, Västerbotten County, northern Sweden. GFF 112, 59-60. Juve, Gunnar (1974) - Ore mineralogy and ore types of the Stekenjokk deposit, Central Scandinavian Caledonides, Sweden. SGU ser C 706. Anthony, J.W., et al (1995), Mineralogy of Arizona, 3rd.ed. : 282; Bunch, T.E. & K. Keil (1969), Mineral compositions and petrologyof silicate inclusions in iron meteorites: Chemistry of chromite in non-chondritic meteorites. meteoritics: 4: 155-158.; Buchwald, V. F. (1975) Handbook of Iron Meteorites. University of California Press. 1418 pages. www.meteoritestudies.com/piatek.htm; Buseck, P. R. (1968). Mackinawite, pentlandite, and native copper from the Newport pallasite. Mineralogical Magazine, 36(281), 717-725. Morgan, V. and Erd, R.C. (1969) Minerals of the Kramer borate district, California California Division of Mines and Geology Mineral Information Service: 22(9): 165; Pemberton, H. Earl (1983), Minerals of California; Van Nostrand Reinholt Press: 66; California Division of Mines & Geology: Mineral Information Service: 22(10) (Oct 1969). Mines of the Washington D.C Area; Bernstein, Lawrence (1980) Minerals of the Washington D. C. area: Maryland Geological Survey Educational Series 5, 148 p.
No reference listed; Lee, I., Ripley, E.M. (1995) Canadian Mineralogist, 33, 723-743. The Canadian Mineralogist Vol.36, pp. 869-886 (1998); Desautels, P., Patelke, R., Maunula, T., & Belluz, N. (2007). Technical Report on the Northmet Deposit, Minnesota, USA. Ramdohr, P. (1973). The Opaque Minerals in Stony Meteorites. Elsevier Publishing Company: Amsterdam, London, New York. Harvard Museum of Natural History specimen no. 133405.
ⓘ Julia Mine (Julian Mine) ? Aleksandrov, S. M. (2005). Genesis and Composition of Borate and Sulfide Mineralization in the Mount Jumbo Dunite, Snohomish County, Washington, United States. Geochemistry International, 43(3), 277-289. Oberthür, T. and Weiser, T. W. (2008): Gold-bismuth-telluride-sulphide assemblages at the Viceroy Mine, Harare-Bindura-Shamva greenstone belt, Zimbabwe. Mineralogical Magazine 72, 953-970.